HomeCOMMENTARYRebecca Sounds Reveille – Wake Up! – Revelation or Conspiracies? We live in world where media has slammed society in every direction. We have print, digital, television, radio, podcasts, YouTube, advertising through the mail, and flyers placed on the streets and windshields of cars parked in the local parking lots. We have fake news, true news, independent news, half and half news, propaganda, infomercials, and colorful palettes of other messages tickling the hairs in our ears, the chambers of our hearts, and the rods, cones, and fibers in our eyes. How is it we are supposed to decipher the overload of information we are receiving? We have to receive the information, and then independently research it all. This can be overwhelming with the amount out there combined with the time involved to do it. One way to zero in on obtaining truth- revelation (def: revelation- to unveil or disclose truth, bring to light what is hidden) is to utilize resources that seek it and are committed to only sharing the things that are true. For example, reading the Bible, reading articles from resources that show evidence of the content they distribute, and ensuring the writer indicates whether or not their writing is an opinion. It seems we have been conditioned to only believe what is being said via mainstream media and to discredit independent sources who have felt a passion to get the truth out there. However, we are seeing a shift in this area; even fake news is sharing news that was once thought of as conspiracy theories and news that members in the mainstream media circuit have doctored. In fact, theories once thought of as conspiracies (def:conspiracies- where more than two secretly plan to invoke some type of harm to another in order to benefit from it) are now being revealed through all types of sources. It truly is up to us to absorb the information we receive and fact check it for ourselves. So where do we start? Like I mentioned, looking at those who we have vetted, as sources committed to sharing the truth, such as The Liberty Beacon are where to begin your research. On this episode, I have four prolific guests who have passion and dedication to doing just that- getting the truth uncovered and brought to light. My guests are: Susan Price, Chuck and Anita Untersee, and Mark Collins. We discuss these concerns and much more, specifically a great resource for you to gain some insight. For many years, I have worked with Susan Price, who is National Gold Star Mother, an Army veteran, Veteran Advocate, Investigator, National Speaker (60 minutes and 2016 Florida Trump Rally) and Writer. I have seen the depth in which she exposes information hidden so deep, the excavation makes ones head spin! Recently, she shared with me a documentary, REVELATION: Dawn of Global Government, which takes so many once thought of as conspiracies, and in about an hour and forty five minutes, succinctly covers and places them in a concise format. This is a great starting point for those who have been trying to grab bits and pieces from everywhere, as well as, an excellent expansion of knowledge for those who have been digging for quite some time and see how it all ties together. It is an eye opener and breath grasper all in one. What is impressive, well, the whole movie is, nevertheless, the highlights are those who have shared their discoveries and why this information is important. Chuck and Anita Untersee, a thirty- six year husband/wife team, who had worked in Los Angeles for over a several decades in the film business, working with such clients as Disney, Ford, American Airlines, Apple, Chevrolet, U.S. Army, Benjamin Moore, KIA, Mutual of Omaha, Honey Baked Ham, Meineke Muffler, Time Life, Mexican Tourism and Aloha Airlines, while based in Los Angeles. The two began the REVELATION, Dawn of Global Government project almost six years ago, filming on location in 25 states and are also known for their movie, Behold a Pale Horse: America’s Last Chance . Chuck is a retired Army Officer and sixth generation Texan, who with Anita now lives on a ranch in The Texas Hill Country. Their commitment to getting the truth out there has been arduous but necessary. Mark Collins, is an actor, known for his role in The Revolution, Left of Center, National Treasure: Book of Secrets and Revelation: Dawn of Global Government. He has also portrayed Washington, sans script, in a number of speaking engagements with a varied audience of military, schools, churches, and parades. 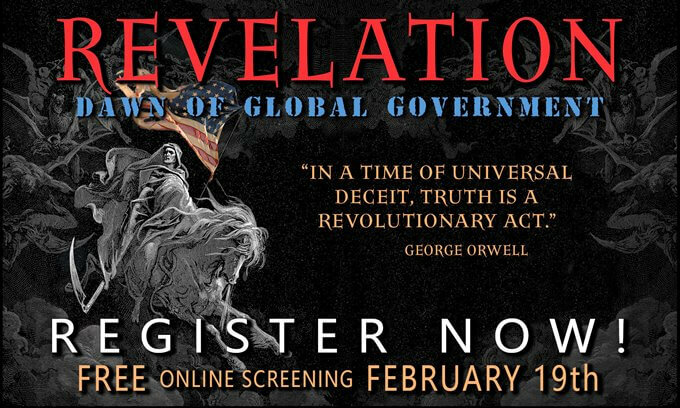 REVELATION: Dawn of Global Government, General Trailer from Revelation Movies on Vimeo. Charlie Daniels, Lt Gen William Boykin (U.S.Army Ret) Mark Collins as Gen George Washington, , Alex Jones, Dr Jerome Corsi, Ted Nugent, Cliven Bundy, Ted Nugentand many other Patriots and Professionals. The American Republic, Christian faith and liberty are rapidly being destroyed by a Trojan Horse of globalism. As we have slept…”CHANGE HAS COME TO AMERICA”! Awakened late, we will find ourselves enveloped, suffocated in a global prison planet. Americans know change has arrived. Few realize how truly wrong it has gone. Issues of control are far greater, far darker than which party dominates the political spectrum. A small nucleus of motivated people can change the course of history. To do nothing is to declare defeat. The Republic weeps. Listen to her cry! 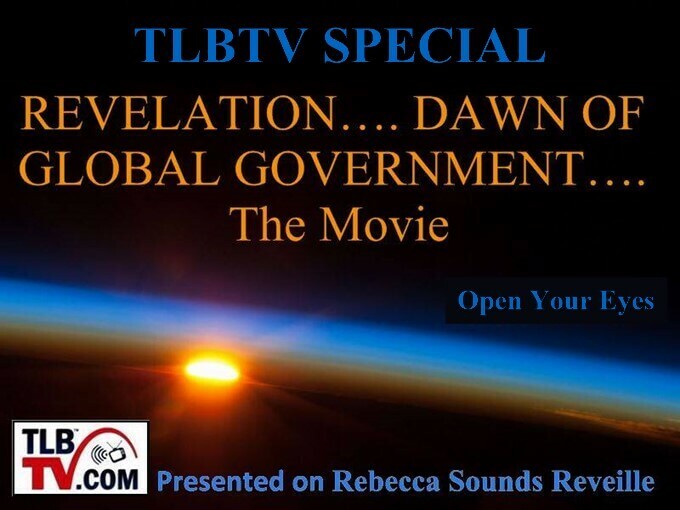 Here is what IMDb summarizes about REVELATION: Dawn of Global Government: Looming world government, a world “elite”, The United Nations…loss of American sovereignty! The light of our “shining city on the hill” dims. Dissecting America under judgment, Lieutenant General William Boykin and Alex Jones join Charlie Daniels in a primer for the uninitiated on The New World Order with Biblical perspective. The global feudal police state unfolds…We were born for such a time as this! Click on the image to Register to watch the movie free on February 19th, 2018. To find out how to host a local screening CLICK HERE. About Rebecca L. Mahan: Rebecca is The Liberty Beacon Project Media Director, a United Stated Marine Corps veteran and a retired police officer of over 10 years. Rebecca is a published author and had been a long running columnist for a community college newspaper. She has also been an award winning radio show host and has produced, booked, and interviewed guests for her shows. Her education includes: Associates degrees in Christian Studies, General Education, General Business Management, and Law Enforcement. Rebecca also has a Bachelor’s degrees in Church Ministry and Occupational Studies -Vocational Arts, as well as a Master’s degree in Biblical Studies. She is a certified Mediator and Event Planner.